"I can only celebrate the beauty of the natural world and the joys of life when I also acknowledge the ways that these gifts can be twisted and destroyed." Readings will begin at 7 p.m. followed by a reception featuring wines from many participating countries and light hors d'oeuvres. 100% of the proceeds will benefit NMWA's "Bridging Communities" Program promoting cross-cultural exchange among elementary school children in the Washington, D.C. metro-area. $10 general admission. Limited seating. For reservations call 202-783-7370 or email reservations@nmwa.org before November 1. Lucy Hogg's installation of a large scaled equestrian painting, digital prints, and video is a meditation on the end of painting. The Last Pony project is a meditation on the end of painting, at least the end of it for Lucy Hogg. Her image of a horse poised at the edge of a cliff is based on Whistlejacket by George Stubbs (c. 1762). Stubbs, at the request of his original patron, had left the background blank. Into that void Hogg has inserted the landscape from an earlier equestrian painting by first name Velasquez, his Phillip IV on Horseback (c. 1634). The Spanish monarch's reign has striking similarities to the second Bush administration. Riderless, the horse is about to plunge into the unknown. The figure represents either the epitome of autonomous action or a fearful flight. Hogg's longstanding photographic interests are now merging with painterly ones that are receding. Working with a scan of a photograph of her equestrian painting, she realized the wide array of color schemes she could have used for the original. The computer, that is, provided options - "colorways" to use a term from commercial textile production that were unavailable in a traditional studio. Once photographed, the white elephant of the museum-scaled history painting becomes artefact, documented in its last natural habitat of the studio, before it is unstretched and rolled away for storage. As a digital scan it becomes still further reproducible and customizable; the formerly unique object, already twice removed from its original authors, Velesquez and Stubbs, is domesticated for democratic consumption. No, this isn't Halloween Festivities on Saturday midnight and into the wee hours of the morning! (Although some of us were dressed in costume). 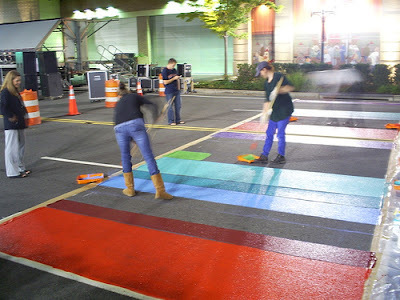 We had the pleasure of painting colorful stripes on a street in Crystal City. Later that morning the Marine Corps Marathon runners crossed Memorial Bridge and ran over our racing stripes. 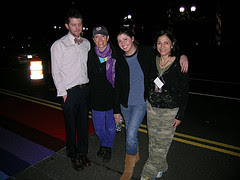 The artist crew and I marveled how wonderfully intense the color stripes were, even by streetlight. President and CEO, Angela Fox of the Crystal City BID was inspired to do a Racing Stripes art project after seeing the Colorfield Remix, 8th Street Stripes, a public art project directed by the Corcoran College of Art and Design and the DC Commission on the Arts and Humanities in Washington, DC. It was decided to do colorful racing stripes for the Marathon runners and community. After the design process, I put a team of local artists together and we were off to the races. The stripes were a hit and added to the days festivities. Me... I went home afterwards and dreamed of colorful lines crisscrossing the city. You can see the racing stripes over the next few months at 2100 Crystal Drive. Enjoy a nice lunch or dinner nearby. Crystal City BID brought Artomatic to a wide audience this year and continues to provide a variety of art programming to the Washington, DC metropolitan area. The Mexican Cultural Institute’s annual opening of the Altar de Muertos (Altar of the Dead) in celebration of the Día de los Muertos (Day of the Dead) is one of the most important events of the year. On this occasion the Altar will be dedicated to Frida Kahlo, celebrating the 100th anniversary of her birth. Frida Kahlo is undoubtedly one of the most influential Mexican women artists and was instrumental in introducing Mexico and its culture to the world. 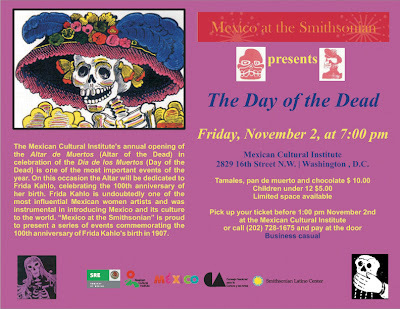 “Mexico at the Smithsonian” is proud to present a series of events commemorating the 100th anniversary of Frida Kahlo’s birth in 1907. Read this informative article by William Hanley about the role curators are playing in organizing exhibitions. "In a recent essay about the task of organizing an exhibition, star curator Robert Storr, who directed this year’s Venice Biennale, made a point of distinguishing between people he called “exhibition makers,” who are responsible for putting together temporary shows, and curators, whose “primary concern” is the “care and preservation of art.” Read here from the fall 2007 issue of Museums magazine. Anne Ellegood of the Hirshhorn Museum is also mentioned. The Washington Convention Center Authority said Monday it is changing the name of the city's convention center to honor D.C.'s first elected mayor, Walter E. Washington. The 2.3 million-square-foot center at 801 Mount Vernon Place NW is currently known as the Washington Convention Center. Constructed in 2003 for $850 million, it is the largest publicly financed project built in the city. The building will officially become the Walter E. Washington Convention Center at a dedication ceremony Nov. 5, the authority said. The D.C. Council approved the legislation for the name change last year. In this new work Meyers continues to pursue a meditative ideal, the perfection in repetition. Her lines, however, have taken on a different curvilinear form. The drawings float between optical illusion and grand simplicity, spinning and twisting in front of our eyes. Meyers maintains her method of mark-making, one line followed by the next with the same spacing and the same trajectory; but, the first line has evolved into a challenge all its own. Harking back to the story of the Greek artist Apelles who was so talented as a draftsman that he was able to render a perfect circle free hand, Meyers tackles this new challenge with the same determined process she has pursued for the last decade and a half. The drawings read almost as graphs of an undulating topography, swirling whirlpools or weather patterns. But, they are measured and specific. They are in fact an artist’s graph of time and work. Some of the pieces read as if they are blossoming and growing through a sort of linear mitosis, while others are contained in themselves, circling indefinitely. They suggest Buddhist sand mandalas, which are said to contain the entire universe in microcosm and are used as aids in meditation. Linn Meyer’s received her BFA from Cooper Union, New York and an MFA from the California College of Arts in Oakland. She is the recipient of a Pollack Krasner Grant. Her work was acquired this year by the Hirshhorn Museum and Sculpture Garden. ENTRIES Selection of work will be done from the actual pieces, and not by slide or digital images. All works must be BROUGHT to the gallery during gallery hours of 12 to 5 PM on Saturday, Dec. 8 or 9 from 12-4 PM on Sunday, Dec. 9. No shipments will be accepted. Artists may submit up to four pieces of work for $30. 2-D work must be framed and wired, 3-D sculptures and craft works must be fully assembled and ready for display. ENTRIES: Jurying will be from digital images (strongly recommended) and slides. Diskettes and CDs must be labeled with artist’s name. Digital images should be 72 dpi JPEGs, maximum 600 pixels in any direction. File names should be artist’s last name followed by title. All entries must be received at the gallery by 5 PM on Wednesday, December 12. Artists may submit three images for a non-refundable fee of $35. For sculptural pieces, two images for each piece may be submitted. Emerson Gallery: Postcards from the Real: Works by Josephine Haden Using subtle but efficient compositional devices, Arlington artist Josephine Haden toys with perceptual expectations in these large-scale landscape based paintings of open-ended allegorical vignettes. Blending open sky, vast bodies of water and soaring vistas with magazine, vacation and animal imagery, Haden creates visual stories that ask as many questions as they answer. Like postcards from another time and place, these paintings offer viewers a glimpse into a world where imagination transforms the mundane and banal into the extraordinary and unexpected. Atrium Gallery: Genomes and Daily Observations: An Installation by Suzanne Stryk In this installation, Virginia artist Suzanne Stryk brings together a grid of exquisitely poetic drawings of natural objects and modern genetic symbols, an antique desk depicting the workspace of a nineteenth century natural historian, and a mirror reflecting both the images on the walls and the image of the current viewer. Using these basic elements, Stryk contrasts and blends today's world of high tech science with the more intimate knowledge of nature gained through the careful and close observational scientific techniques of the past. At the heart of this work are questions regarding the reconciliation and coexistence of scientific knowledge with a personal reverence for the mysteries of nature. Ramp Gallery: Fairy Tales: Paintings by Joy Every: Landscape, fantasy and fairy tale co-exist in these expressive paintings which draw heavily on images from the subconscious and both dark and lightuniversal symbolic content. Color, pattern, texture and other formal compositional elements are explored within the context of the landscape, while mysterious imaginary worlds are seamlessly blended with the familiar. Hours are T - F 10 am - 4 pm, Saturday 1 - 5 pm. The DC Commission on the Arts and Humanities in collaboration with the District of Columbia, Department of Driver and Motor Vehicles is seeking an artist or artist team to design a specialty arts vanity license plate for the District of Columbia. The theme for the license plate is "Artistic License". The design should inspire residents and visitors to support the arts and help bring attention to the DC Commission on the Arts and Humanities. This call is open to artists who live in District of Columbia. The DC Commission on the Arts and Humanities is seeking 12 artists to take part in a thought provoking large-scale outdoor exhibit entitled Emerge, the third phase of the ArtWalk exhibition. Through artist interpretation of Emerge, the premise and goal of the exhibition is to present 12 diverse artworks with a common theme that will draw the attention of both Washington, DC residents and visitors. ArtWalk is a project of the DC Commission on the Arts and Humanities' downtown public art initiative, in cooperation with the Washington Convention Center. The ArtWalk features 12 display units each stretching 6 feet tall by 24 feet wide. Open to local, national and international artists with preference given to individuals residing or working in the District of Columbia. 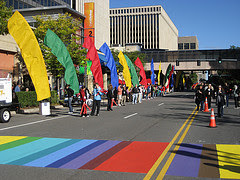 The ArtWalk is located between New York Avenue and H Streets, NW at a pedestrian friendly parking facility that was once the site of the Washington DC Convention Center. Deadline: Wednesday, January 30, 2008 at 7:00 p.m.
Public Art Building Communities Program offers funds for the creation and installation of permanent public art projects with a life span of at least five (5) years. Projects must be installed in the District of Columbia and should encourage the growth of quality public art throughout the city, support local artists and non-profit organizations, and make public art accessible to District residents. Projects must provide exposure of public art to the broader community or to persons traditionally underserved or separated from the cultural mainstream due to geographic location, economic constraints, or disability. Eligible projects include, but are not limited to: sculpture, mosaics, murals, paving patterns, custom benches, stained glass windows, artistic gates and railing, etc. Funding is available for all fees associated with the design, fabrication and installation of the artwork(s) including: artist fees, materials, insurance, engineering, shipping, fabrication and installation services, permits, copyright registration, and photographic documentation. Projects with youth and senior involvement are encouraged. For more information, please visit www.dcarts.dc.gov . If you have further questions please email Deirdre Ehlen at Deirdre.Ehlen@dc.gov or call (202) 724-5613. Joshua Zumbrun reports on the state of Eastern Market in today's article in the District Extra. Read here. It is a promising description of the return of business to the historic market. The neighborhood was picked as one of the country's Ten Great Neighborhood's by the American Planning Association. Go see for yourself how the market is doing. Keep going, buy from the wonderful vendors and support the arts with your patronage. You can see the 27 murals installed by the DC Commission on the Arts and Humanities on the historic Eastern Market windows while visiting and purchasing art from the artist vendors at the market. Eastern Market is at Seventh Street and South Carolina Avenue SE. 9 a.m. to 6 p.m. Saturdays and Sundays. Farmers' line, 7 a.m. to 4 p.m. Saturdays and Sundays. For more information, go to http://www.easternmarketdc.com. This group exhibition features photographs depicting an obsessive crush on military generals by Lisa Blas, 4' by 5' photographs of waves by Peter Garfield, a formal take on glass and other wave like forms by Michele Kong, and undulating rainbow colored paper sculpture and drawings by Jen Stark. OPENING RECEPTION: THURSDAY, OCTOBER 25th, 6-8pm. In tribute to the late William Warren Parker’s support for emerging DC artists, his family has generously donated space at the William W. Parker (WWP) Gallery– housed in Mickelson’s Fine Art Framing at 629 New York Ave NW - to WPA\C for a new “nine-by-ten” exhibition series: 9 shows of 10 member artists each. Originally developed in 1981 by the WPA board of directors, the first WPA OPTIONS biennial was curated by legendary artist Gene Davis and Washington Review editor Mary Swift. Continuing with this historic and eagerly anticipated exhibition, OPTIONS 2007 curator Paul Brewer, Director of the Hudson Valley Center for Contemporary Art, has selected 10 emerging artists who represent the creative diversity of the region. 2007 marks the 12th year of OPTIONS and the ongoing dedication of the WPA\C to support, promote and encourage new and emerging talent, as well as to stimulate dialogue between established and emerging artists, and the regional community. Which Came First? Drawing Conclusions, an exhibition by Kari Minnick, features glass "collages" that combine bold composition, sensitive drawings, and fluid edges. Using flame-worked linear elements and images drawn directly into glass powders, Minnick creates signature pieces reminiscent of gestural drawings. Minnick's expressive use of line and manipulation of light break new artistic ground in the painterly expressions that emerge from hand-cut glass. Minnick holds a degree in studio art from the University of California and has worked as an exhibiting artist and educator for twenty years.She recently opened Kari Minnick Art Glass Studio in the heart of the new Arts and Entertainment district in Silver Spring, MD. Selected by the Hillyer Art Space Advisory Committee for Washington Region Programming, Minnick was recommended due to her unique talent and vision. IA's Hillyer Art Space is funded in part by the DC Commission on the Arts and Humanities, an agency supported in part by the National Endowment for the Arts. Fall Open Studio show and sale. Visit neighboring artists also opening their studios to the public. 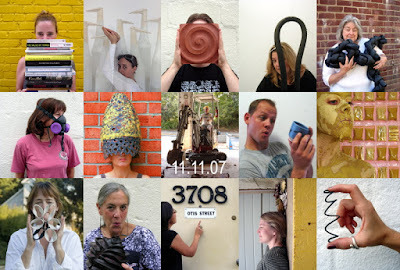 From top left: Kate Hardy, Ani Kasten, Sean Lundgren, Mila Kagan, Sandra Dwiggins, Leila Holtsman, Judit Varga, Margaret Boozer, Joe Hicks, J.J. McCracken, Elizabeth Kendall, Liz Lescault, Kyan Bishop, Tetyana Wittkowski and Laurel Lukaszewski. Red Dirt Gallery hosts an exhibition of work by artist-in-residence Ani Kasten through Dec. 9. Join the Washington, DC chapters of the Women's Caucus for Art and ArtTable on November 11, 2007, from 1:30 p.m.- 4:00 p.m. at American University's Katzen Arts Center for a lively discussion of how and whether the feminist art movement has made a difference for women in the arts today. The forum will be held at the Abramson Family Recital Hall in the Katzen Arts Center, which is located on Ward Circle at Nebraska and Massachusetts Avenues, NW. There is no charge for the event. The forum Opening Doors, will feature presentations by a panel representing a range of cultural, professional, and generational perspectives. The audience will be included in the discussion, which will continue over light refreshments in the lobby. The panelists sharing their experiences and insights include: Judy Byron, a feminist printmaker and installation artist; HIRO, an Asian-American painter and teacher, who has focused on issues of race and gender; Victoria Reis, the co-founder and director of Transformer, an arts organization that promotes emering artists; and Joyce J. Scott, the African American performance and visual artist known for her beadwork sculpture and jewlery. Moderator, Josephine Withers, a pioneer in the field of women's studies and a founder of the Washington Women's Art Center, will facilitate the discussion with the panelists of how our lives and the art world have changed since 1972. The forum Opening Doors coincides with two important anniversary exhibitions on view in Washington: WACK! Art and the Feminist Revolution, at the National Museum of Women in the Arts, September 21 to December 16, 2007, focuses on feminist art acround the globe from 1965 to 1980, with nearly 300 works by 118 artists. Claiming Space: Some American Feminist Originators, co-curated by Norma Broude and Mary D. Garrard, pioneering feminist scholars, will be at the American University Museum, Katzen Arts Center, November 6, 2007 to January 27, 2008. It features forty large-scale provocative and breakthrough works by twenty founders of the Feminist Art Movement in America from the 1970s. "Claiming Space" will be on view from 10 a.m. to 5:00 p.m.; come early to see the show before the forum. The impetus for the exhibitions and the forum is the 35th anniversary of the founding of the Women's Caucus for Art and many other feminist milestones. ArtTable celebrated its 25th anniversary in 2005, and this year is the 20th anniversary of the National Museum of Women in the Arts. Both the Women's Caucus for Art and ArtTable are Founding Program Partners of The Feminist Art Project, a collaborative national initiative celebrating the Feminist Art Movement based at Rutgers University. For more information, call 202-885-1300. Once again, over 20 artists are throwing open their doors for Fall Mid City Artists Open Studios. This is a unique opportunity to see some of DC's most exciting artists in their home environments – and to visit the local galleries and businesses. Many artist studios within walking distance of the Dupont/Logan Circles will be open for visitors. Check out the burgeoning local art scene that is finding its focus in the dynamic Mid City neighborhoods, and visit some of the supporting Galleries and art related businesses that have recently opened – following the artists into this upscale urban environment. Visit www.midcityartists.com for more information, view artwork and to download a map. Irvine Contemporary is pleased to announce the representation of Paul D. Miller (DJ Spooky). Their first project is an artist’s edition of Miller’s video and music composition, New York is Now, which was selected for the African Pavilion at the 2007 Venice Biennale. A set of photographic prints from video stills will accompany the new edition of the video. The new edition of New York is Now will premier in December 2007 in Miami during the ArtBasel/Miami week at the Scope Art Fair and a VIP screening at the Rubell Family Collection, which will feature a talk by the artist. A gallery exhibition is being planned at Irvine Contemporary for spring 2008. Paul D. Miller is a conceptual artist, musician, and writer based in New York. Miller’s work as a media artist has been presented in multiple venues over the past nine years, including the Venice Biennale (2007), the Trienal de Luanda (2006), Palais de Tokyo, Paris (2004), the Whitney Biennial (2001), Mass MOCA (2003/2004), Los Angeles Museum of Contemporary Art (2002), P.S.1 NY (2001), The Venice Biennial for Architecture (2000), the Ludwig Museum, Cologne, Germany (1998), the Kunsthalle, Vienna, The Andy Warhol Museum, and many other museums and galleries. "This Is Forever", a solo exhibition featuring intricate paintings and a site-specific installation by Beau Chamberlain. Inspired by the ability of nature to attract, camouflage, and repel, Beau Chamberlain's precise paintings hover between abstraction and figuration. Beginning with elusive imagery from botany and entomology, Chamberlain embraces crossovers between divergent biological categories, the pliable and resistant, from one ecosystem to another. Evoking lunar landings, molecular imaging and Chinese landscape painting, Chamberlain's work explores mutation, imitation and definability in seemingly serene environments in which time, place and scale remain undefined. Chamberlain elaborates, "The titles give my paintings a loose narrative structure that allows the viewer to piece together their interpretation of the scenes upon entering these environments unaware of whether they have just missed something or whether they are in the middle of some future action about to take place. At first, plant and animal life seem to be in a state of suspended animation, unable to break free of the vibrant, reverberating color of their atmosphere, but, at closer examination, the seemingly static landscapes reveal themselves: they are teeming with life. Undulating organic forms float through space, creating tension with one another and their environment. Hollow cocoons, empty trees and headless serpents are some of the recurring symbols of life and death, strength and instability, predator and prey. Nothing in these environments can be taken at face value." 8pm reception to celebrate the success of The Grate Project. Featuring music by Dj ikon and Dj StereoFaith, and video projections documenting the creation of The Grate Project. Via a grant from the Creative Communities Initiative, Kelly Towles has created murals on the roll-down security grates at One World Fitness, outside the artist studios at 926 N Street in Blagden Alley, and on the entire facade of The Black Cat nightclub. One of Transformer's first public art projects, The Grate Project is intended to further dialogue about the nature of street art and public art work, while enhancing DC's street-scapes. Experience the 19th-century precursor to cinema. Magic Lantern shows narrate stories through projected color imagery, live music, and boisterous audience participation. A joint program of events held at La Maison Française and at The Phillips Collection, centered around the Impressionists by the Sea exhibition. For more information on programs at The Phillips Collection, please visit: www.phillipscollection.org. Co-sponsored by The Phillips Collection, the French-American Cultural Foundation, and La Maison Française. Admission: $20 and free for Phillips Patrons and Circle members. For more information and to register, contact www.la-maison-francaise.org . All are welcome. Please RSVP to info@wpadc.org by October 25. ...community member requested the tunnel be brightened with artwork, said Tony Gittens, executive director of the DC Commission on the Arts and Humanities. Muralist G. Byron Peck designed the art for The Southwest Gateway. The tunnel, near the Potomac River waterfront, connects to the northwest quadrant of the city. The art will cover both sides of two tunnels – one northbound and one southbound – and each is about 11 feet high and more than 300 feet long. G. Byron Peck's design shows a combination of abstract images representing the riverfront, Peck said, such as dogwood, herons, willow trees and fish. These larger abstractions are separated with serpentine stretches of color so drivers and walkers can view them in succession. Many good things are happening in the arts. I hope to see you again at one of them soon. Your invited! Here are two exhibition offerings for the fall season.......please come by, say hello, see my new work and just maybe collect some new art! Premier*: Sunday, October 21, 12-5pm as part of the Dupont Circle House Tour http://www.dupont-circle.com/housetour/index.html> tickets required. Artist's Reception: Friday, October 26th, 6-8 pm. With a growing reputation as an awesome party and fantastic opportunity for beginning and seasoned collectors to purchase some of the best visual art that DC has to offer, attendance to the auction is sure to sell out, so buy your tickets early! Attendance is $100 if received by 10.27.07; $125 after this date. sponsored in part by The UnderArmour Baltimore Marathon, Baltimore Community Foundation, Free Fall Baltimore, City Paper and the Baltimore Metropolitan Council. Art so fresh the paint's still wet! The first person to answer where the term Yip-Yip comes from gets in free. NEWS: Civilian @ Scope, Miami! Scope has produced seventeen art fairs in New York, Miami, Los Angeles, London, and the Hamptons. At the fair, Civilian will present photography, painting, drawing, video, and site specific installation by regional and national artists including Jen Stark whose work will be featured in our Nov. 2nd group exhibition. Founded in 2006, Civilian Art Projects is Washington, DC's newest gallery gnawing at the edges of contemporary aesthetic discourse. Through a challenging exhibition series supporting promising, up-and-coming artists working in a broad range of media, and through exciting events of cultural and social significance held throughout the season, Civilian will generate new energy, ideas and momentum thereby contributing to culture and community. For more information on the artists or the gallery please contact Civilian Art Projects at 202-347-0022 or info@civilianartprojects.com. Please visit the website at www.civilianartprojects.com. Muralist G. Byron Peck has a new mural up at the U.S. Department of Education. Talented DC students, artists and educators recently participated in the first-ever mural project at the U.S. Department of Education headquarters building at 400 Maryland Avenue, SW. The mural project is sponsored by the department's Student Art Exhibit Program, in a joint effort with the Office of Communications and Outreach and the Office of Innovation and Improvement. Read more at Authentic Art. Made possible through the support of the William G. Baker, Jr. Memorial Fund of the Baltimore Community Foundation, the Amy Newhall/Brightside Foundation, the France-Merrick Foundation, the Joseph and Harvey Meyerhoff Family Charitable Funds, Rosemore, Inc. and The Rouse Company Foundation. Artscape, the Baltimore Office of Promotion & The Arts (BOPA), The Baltimore Museum of Art (BMA) and the Maryland Institute College of Art (MICA) are proud to announce the third edition of the Janet & Walter Sondheim Prize. The prize will award a $25,000 fellowship to a visual artist or visual artist collaborators working in the Baltimore region. The prize is in conjunction with the annual Artscape juried exhibition. Approximately six finalists will be selected for the final review for the prize. Their work will be shown in the Thalheimer Gallery of The Baltimore Museum of Art. Additionally, an exhibition of the semi-finalists will be shown in the Decker and Meyerhoff galleries of the Maryland Institute College of Art during the Artscape weekend. The fellowship winner will be selected from The Baltimore Museum of Art exhibition after review of the installed art and an interview with each finalist by the jurors. The remaining finalists not selected for the fellowship will each receive a $1,500 honorarium. Jurors will be announced by November 16, 2007. 2nd Review – Semi-finalists will be asked to submit an expanded submission including up to 30 images and a description of how they will use the fellowship if they are selected. The review process will be the same as phase one. Approximately six finalists will be selected for the exhibition and final review. Each finalist will meet with a BMA curator and BOPA staff person to determine installation requirements. Works by the remaining semi-finalists will be selected for a separate exhibition at the Maryland Institute College of Art. Final Review – The finalists will install work in the Thalheimer Gallery of The Baltimore Museum of Art. On Saturday, July 12, 2008 the jurors will meet with each artist for 20-30 minutes in their exhibition space for a final interview. After all of the interviews the jurors will meet and decide the fellowship award winner. The award will be announced later that evening at the award reception. - A CD-Rom containing 5 jpeg images of work. Image files on the CD should be titled exactly as follows: last name first, first name, and number corresponding to the image description sheet. Each image should be sized at 72 dpi at approximately 12” x 16” or about 700 kb per image. - Artists submitting time based works may submit up to 10 minutes of work on a DVD. The 10 minutes may include excerpts from up to 5 works as long as the combined time totals no more than 10 minutes. If you wish to submit still and time based works, please include the still images as jpegs. For every still image subtract 2 minutes from the allowed 10 minute time based total. - A hard copy of a one page resume. - A signed and filled out application and image description form. - A $25 application fee. Check should be made out to BOPA. - No application materials will be returned. 1. Artists living in Maryland; Washington, DC; Delaware; Arlington, Fairfax, Loudoun and Prince William counties and the city of Alexandria in Virginia; and Adams, Chester, Franklin, Lancaster and York counties in Pennsylvania are eligible to submit for this exhibition. 2. Artists may not be full-time students at the time of the exhibition and during the granting period. Students who will have graduated by the time of the exhibition and granting period may apply. 3. Artists must reside in one of the geographic areas listed above during time of application and during the entire granting period. 4. Artists who work in collaboration may apply as a group. Each artist’s name and contact information should be listed on the application form. A one page resume for the collaborative group and a single set of support materials should be submitted. 5. Semi-finalists will be required to submit a description of how they will use the fellowship if they are selected. 6. The grant will be paid in monthly installments. $5,200 will be paid for the first month and $1,800 will be paid for each of the following 11 months. If artist collaborators are selected the above payments will be equally divided between the collaborating artists. 7. Winners of the Sondheim Prize will be responsible for paying all applicable taxes. 8. Winners of the Sondheim Prize will be required to file a final report by June 30, 2008, before the final payment. 9. Work submitted for this exhibition will also be made available to curators of the Artscape City-County Exhibitions. Artists from beyond the geographical area and full-time students may send work for review for these exhibitions. Please visit www.artscape.org for a listing of galleries and the City-County application. 10. Artscape, the BMA, BOPA and MICA reserve the right to reproduce images of selected artists’ work for printed or internet publicity, catalogue or marketing purposes. 12. The decisions of the jurors are final. Jurors may change without notification. 13. Finalists will be required to meet with a BMA curator and BOPA staff to finalize their installation needs. 14. Finalists may be required to make public presentations at the BMA at some time during the duration of the exhibition. 15. Previous winners of the Sondheim Prize are not eligible to apply. Previous finalists and semi-finalists may apply. Free Informational Workshop: Join Mid Atlantic Arts Foundation, in partnership with the D.C. Commission on the Arts and Humanities, for a brief overview of the Artists & Communities program and grant application process. This workshop is intended for artists interested in one-to-six month residencies with community organizations and community organizations that are interested in hosting artists. Discussion will include best practices and examples of successful projects. Artists & Communities supports residencies by visiting artists from the District of Columbia, New Jersey, New York, and Pennsylvania at nonprofit organizations throughout the mid-Atlantic region (Delaware, the District of Columbia, Maryland, New Jersey, New York, Pennsylvania, the U.S. Virgin Islands, Virginia, and West Virginia). Proposals for residencies that will occur between April 1, 2008 and March 31, 2009 are due Monday, December 3, 2007. Grants generally range from $5,000-$20,000. Artists & Communities applications/guidelines for 2008- 2009 are available at www.midatlanticarts.org. To RSVP contact Heidi Warren at heidi@midatlanticarts.org or 215-339- 0606. Jeffrey Grove, the Wieland Family Curator of Modern and Contemporary Art, High Museum of Art, leads a discussion with artists Chris Vasell and Monique van Genderen who draw inspiration from Morris Louis and other Color Field painters while forging their own new directions. Support for In Conversation is provided by Dr. Penn Lupovich. Ring Auditorium. A short interview with world renowned artist and emeritus professor of art at the University of Maryland, Dr. David C. Driskell. Dr. Driskell talks about the opening of the new Driskell Art Center at the University of Maryland, his vision, work with young people and more. The Center opens to the public on October 17, 2007. Click above. The Driskell Center's official opening will be held on the week of October 17, 2007, with the exhibition "Evolution: Five Decades of Printmaking by David C. Driskell." The exhibition will remain until March 14, 2008 before starting its national tour in the spring of 2008. Following Evolution, the Driskell Center will feature the next scheduled exhibition, Selections from the David C. Driskell Center's Permanent Collection, curated by Dr. Steele and Dorit Yaron, Deputy Director of the Driskell Center, will open. For the David C. Driskell Center's hours of operation and further information regarding this exhibition and future events and activities, please visit www.driskellcenter.umd.edu or call 301.314.2615. Long View Gallery announces an exciting collection of contemporary art from the collection of Weber Fine Art - five contemporary artists - Zoreh Partovi, Martin Quen and Sam Evans, Nela Solomon, Jeff Surret and Peter Kuttner. Weber Fine Art is a home-based art gallery and artist studio located in Northwest Washington, DC which specializes in residential, corporate and hospitality artwork, with a client list that expands worldwide. Weber Fine Art represents painters, sculptors, photographers, and glass artists and works with designers, art consultants, new and seasoned collectors. Anything goes in this zany exhibition of paintings, paper maché, beaded sculptures, cast bronze and wood by artists who take their humor seriously. Ann Citron, Stephen Hansen, Gary Hughes, Robert C. Jackson, June Walker and Bill Suworoff have exhibited their works across the U.S. This show is one of four a year at the Alternative Gallery Space at 1111 Pennsylvania Avenue NW, curated and managed by Zenith Gallery. The Solar Decathlon is a competition in which 20 teams of college and university students compete to design, build, and operate the most attractive, effective, and energy-efficient solar-powered house. The Solar Decathlon is also an event to which the public is invited to observe the powerful combination of solar energy, energy efficiency, and the best in home design. The team houses are open for touring everyday, except Wednesday, October 17, when they will close for competition purposes. An overall winner is announced on Friday, October 19 at 2 p.m. See the schedule for more information. Born of the elegant marriage of biological knowledge and cutting-edge technology, LEAFHouse, an adaptable resource-efficient house, demonstrates what happens when bio inspired design savvy, traditional know-how, and cutting-edge technology join as integral parts of a sustainable lifestyle. Placing fourth in 2002, and winning the People's Choice Award in 2005, the Maryland team looks forward to the 2007 event. The U.S Department of Energy's Office of Energy Efficiency and Renewable Energy is the primary sponsor of the Solar Decathlon. Lord and Taylor's Fifth Avenue Exhibition is in it's last week. Kaleidoscope Katrina, an exhibit of works by 12 artists from New Orleans in Lord and Taylor's flagship's Fifth Avenue windows, The exhibit, in support of the rebuilding of the New Orleans art community, include Sidonie Villere, Jonathan Ferrara, Jeffrey Pitt, Dawn Dedeaux, Luis Cruz Azaceta, Raine Bedsole, Doyle Gertjejansen, Sally Heller, Jeremy Jernegan, George Dunbar, Margaret Evangeline and Jose Maria Cundin. The art showcased in the windows, plus additional works displayed in a specially constructed gallery in the store's eleventh floor, will be available for purchase, all proceeds going to the featured artists. Lord & Taylor will also make a donation to the SweetArt Katrina Fund. Opening receptions: October 13, 7:00-10:00 p.m. The Last Next is an exhibition of paintings and drawings by Washington-based artist Kristin Holder. Works from 2002 until the present will be included in the exhibition, including a site-specific wall drawing. In recent years Holder has been the recipient of the Second Place Trawick Prize, a Pollock-Krasner Foundation grant, and a one-year fellowship from the British Academy in Rome. Her work is included in several public and private collections. Kristin's statement about the wall piece she created for the original 100 year old wall on the 3 floor of warehouse. The wall drawing is made by using the actual dimensions of the wall to establish the scale. Working freehand, two circles are drawn side by side touching in the middle of the wall and then each touching the left- and right-hand sides of the wall. Inside each of the circles are drawn isometric cubes. Using a cubic fractal called a Menger Sponge, cubes within cubes are drawn until the middle point of the circles is reached. The first phase of the drawing utilizes lines and the second plays on mass. Executing the formula of a Menger Sponge on a mass yields a “mass-less mass”. The wall plays a critical role in determining the size and density of the forms. Working from the center point of each circle, powdered graphite is applied to the wall directly and rubbed into its surface. All of the wall’s irregularities, damage or remains from previous uses are equalized through this process. The graphite normalizes the history of the wall, while making it more evident through the material’s luminescence. Two solid cubes emerge through this process, different in size, perspective and perceived weight. The title of the wall drawing is indebted to Albrecht Dürer’s Melencholia I. In this famous print there is a mysterious polyhedron and a brooding muse, symbolizing the intellectual situation (and snare) of the artist. The number I in the title probably represents the first (and lowest) tier of artistic creativity: the imagination. The next is reason and the third, and highest, is spirit. On the left-hand side of the wall drawing the polyhedron is shown from the point of view of the muse (her) and on the right from the point of view of the Dürer (his). 50 area RISD Aumni show their art - paintings, sculpture, video, photography. RISD DC/Baltimore Biennial 2007, an exhibition of art and design work featuring local alumni from The Rhode Island School of Design. The show features recent work by RISD alumni who graduated between 1950-2006, and who now live and work in the Washington Metropolitan area. The works are representative of the careers alumni have pursued after studying at RISD and include fine art and design: drawing, painting, printmaking, photography, sculpture, furniture, jewelry, ceramics, graphic design, architectural design, new media, and more. All work will be for sale and a portion of sales will be donated to the RISD Diversity Scholarship for the purposes of providing tuition assistance to minority students. Rhode Island School of Design, founded in 1877, is located in Providence, Rhode Island. It has earned a worldwide reputation as the preeminent art and design college in the U.S. There are over 450 alumni currently living and working in the Washington, DC Metropolitan area, and 21,000 alumni around the world. Warehouse’s gallery hours are Thursday and Friday 4:00 – 8:00 p.m.
Saturday and Sunday 1:00 – 6:00 p.m. The nearest metro stop is Mt. Vernon Square/Convention Center on the Green Line. This year, the annual Festival of the Building Arts takes you behind the scenes of the building trades and asks, “how do they do that?” Join as many as 25 master craftspeople and take part in hands-on activities during this exciting, interactive, fun-for-all-ages celebration of our built environment. The Festival will feature a life-size, green-build playhouse as part of HomeAid’s National Project Playhouse. Built by Pardee Homes, the playhouse is being donated to the Museum and will debut in the Building Zone exhibition with a ribbon-cutting ceremony at 10:15 am. across the street from the Judiciary Square Metro (Red Line). Wheelchair access is available through the G Street entrance. Admission is free. A donation of $5 per person is suggested. October 11– November 17, 2007Opening reception: Thursday, October 11, 6 – 8 p.m.
Georgia Deal reveals the artist’s exploration of personal narratives through a variety of integrated mixed media printmaking processes. The quirky works, compiled on handmade paper, exploit the properties inherent in their construction and examine themes of escape, home, shelter, fear and isolation. Manon Catherine Cleary ˆ by any earthly measure ˆ is a luminary among Washington DC artists. Globally exhibited and collected, Cleary has enjoyed a forty-year career as an artist and teacher, and is principally acclaimed for her virtuosic and conceptually provocative enlistment of oil paint and graphite to photo-realist ends. It is with great honor, then, that DC Arts Center will showcase the artist's very newest "skyscapes" in its gallery during the month of October ˆ works rendered and mounted in remembrance of Cleary's dear friend and DCAC founder and patron Herb White, in whose company she spent countless contented hours "chasing clouds." For 19 years the space occupied by DCAC has been donated by DCAC founder Herb White. Herb's Choice has become an annual DCAC tradition, allowing Herb to choose the theme or featured artist for a show in the gallery. Herb White passed away in June of 2007, but before his unexpected death he expressed hope that the 2007 Herb's Choice show would feature prominent DC artist and longtime friend, Manon Cleary. DC's own Thievery Corporation, a two-time Grammy Award-nominated music act, and NYC's own Nickodemus swap remix duties and plenty of exotic "outernational" flair on this new vinyl 12" from ESL Music. The A side features Nickodemus' boom bap Near Eastern bhangra style remix of Thievery Corporation's "Supreme Illusion" from the acclaimed compilation ESL Remixed: The 100th Release of ESL Music, now available on vinyl for the first time. The B side features Thievery Corporation's Middle Eastern jazz-house remix of Nickodemus' classic "Crazy Stranger." Two exclusive musical gems on 12" vinyl, and packaging featuring unique artwork (album cover art) by our own DC based artist and activist Nikolas Schiller. Not to be missed! Nikolas Schiller never fails to amaze me with his marvelous digital art. The cover art he created for "Supreme Illusion" is of the Pentagon and Lower Manhattan. The record will go on sale October 8th. You can purchase it from ESL Music, Groove Distribution, or at your local vinyl specialty shop. October 1, 2007 - January 6, 2008. The exhibition J .M. W. Turner is the most comprehensive survey of Turner's work ever presented in the United States. More than 145 paintings and watercolors reveal the astonishing talent and imagination of this artist. An art happening by Project 4 and The Pink Line Project. $10 suggested donation at door to benefit The Pink Line Project’s emerging artist grant program. Thanks to Fathom Creative for providing the space. LUSTER, an evening of decadence to benefit emerging art and music in Washington DC. The event will feature cocktails, live music, and an art exhibition that explores ideas of luxury and excess amid the debris of an abandoned brake shop. The questioning of high-end retail and luxury goods has become a strong current in contemporary art and culture – specifically focusing on the obsession with consumption and luxury in America. The featured artists incite this contemplation, using the tools of commercialism and the allure of gold to appeal to your desires as a consumer and redefine the notion of what is art. Project 4 is a new voice in the growing Washington D.C. art scene. The gallery's programming promotes an international, forward-thinking exhibition schedule of contemporary art and design. Focusing on one-person shows and thematic exhibitions by mid-career and emerging artists, the gallery also invites guest curators to host exhibitions emphasizing trends in contemporary art and design. It is, in effect, a room for art and ideas spanning a range of cultural issues. The Pink Line Project supports outstanding artists who contribute to excellence in the arts in Washington, DC. Founded by Philippa P.B. Hughes, The Pink Line Project fosters intellectual and artistic innovation through programs and events that are fueled by the transformative power of art. Opening Reception: Thursday, October 11, 6 - 9 pm. New paintings by award winning Polish artist Michal Zaborowski will be featured in a solo exhibition at the Nevin Kelly Gallery, 1517 U Street, NW, in Washington, DC. The exhibition, titled "H20" will depict ordinary people in everyday activities associated with water. Gallery owner Nevin J. Kelly describes Zaborowski as "a romantic impressionist with a contemporary voice; Zaborowski is one of the most talented painters working in Poland today." The artist's paintings depict what Kelly calls the "nobility of the mundane." He paints ordinary people in ordinary activities, but he gives them such heroic import that one is compelled to look at them. He finds such beauty in these ordinary events-a man and a dog in a boat, or a woman with a toy balloon - that we wish we could trade places with them. The artist's palette is subdued. There is a mixture of beauty and a gnawing sense of melancholy in his paintings, a combination so common in our everyday lives that we almost fail to notice it. Zaborowski reminds us that, even in moments of personal darkness, a moment of sublime beauty is just around the corner. Doors open at noon; an art party is 6 p.m. to midnight. Steve Mead, Antoinette Wysocki, Jodi A. Patterson, John N. Grunwell, Dan Rosenstein, Alexandra Zealand, Alexandra Silverthorne, Kim Reyes, Emily Berl, Christie Ortiz, Rhett Rebold, Raju Singh, Steve Loya, Stephen T. Hanks, Matthew Best, Graham Meyer and Adam Eig. For the first show, “Art in Transition,” a group art show held in 2005, 27 Washington, D.C.-area artists displayed their work in four transitioning commercial spaces in Silver Spring, Md. Jesse Cohen, founder of artdc.org, explains that this years “empty” building provides transitional space to develop a grassroots art show, which isn't available through existing spaces. Mark S. Waskow an art collector and founder of the Waskomium in Burlington, Vt. is the juror. Pieces include 2-D, 3-D and installation art. HAMILTONIAN ARTISTS is currently seeking fellowship applications for the 2008-2009 season. Dedicated to support the professional development of emerging visual artists, Hamiltonian Artists is a new 501c (3) nonprofit organization offering an annual national competitive fellowship program for ten promising innovative artists. All So-Hamiltonian Fellows will be provided with: a stipend, representation by the Hamiltonian Gallery, an annual focused exhibition, seminars and mentorship programs led by arts and business leaders, and career placement assistance. Byron Peck of City Arts is a Local Hero! Bank of America has selected Byron Peck as one of five Local Heroes in the DC area as part of its Neighborhood Excellence initiative. City Arts nominated him and Byron will receive a $5,000 check to give to his favorite charity. There is an awards ceremony next month with all the heroes. We all know it is well deserved! John and Yoko: A New York Love Story. Govinda Gallery announces John & Yoko: A New York Love Story, an exhibition of photographs by Allan Tannenbaum. Presenting over fifty black and white and color photographs taken from 1973 to 1983, this exhibition also celebrates the publication of John & Yoko: A New York Love Story by Allan Tannenbaum (Insight Editions 2007), with a preface by Yoko Ono and an introduction by the book’s editor Chris Murray. A stunning limited edition John and Yoko: A New York Love Story is available to collectors for $200.00. This edition is limited to 1250 signed and numbered books in a white cloth bound portfolio box with embossed title. An original, signed photograph by Allan Tannenbaum, produced especially for this edition, has been included in a portfolio sleeve unique to this edition. Also included is a facsimile compilation of three articles in the Soho Weekly News from December 1980 featuring John Lennon and Yoko Ono. Joan Konkel transforms commonplace materials into intriguing works of art that play tricks on the eye. Historic Dupont Circle Main Streets announces that tickets are now on sale for the 2007 Taste of Dupont. Last Year, over 200 attendees dined on superb culinary treats from local restaurants. Participating Restaurants and Art Galleries will be announced shortly. 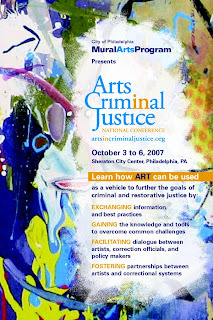 The Mural Arts Program is excited to be hosting the Arts in Criminal Justice National Conference this October 3rd through 6th. Registration is now available on-line at the Arts in Criminal Justice Conference website. This exciting Conference will convene over 200 artists, activists, nonprofit professionals, prison officials, judges, and policy makers on the subject of art in criminal justice. Participants will discuss successful programs from around the country, analyze the power of art to further the goals of restorative justice, and address the multiple challenges inherent in this work. MAP looks forward to sharing its successful models using mural-making and art creation as tools for crime deterrence and reparation through its mural programs in the Philadelphia and Pennsylvania prison systems, detention centers, alternative sentencing programs, and schools. Reserve your spot and spread the word! BA in arts-related field and one year relevant work experience preferred. The candidate MUST have excellent writing and computer skills and the ability to work independently and self-motivate. A desire and ability to take initiative in developing projects is also a plus. 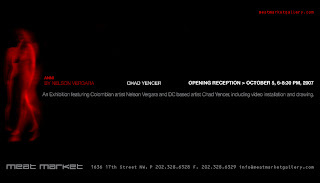 Please submit cover letter, resume and three references to info@nevinkellygallery.com or fax to 202-232-3465. No phone calls please. The Eastern Market neighborhood has been recognized as one of the nation's 10 Great Neighborhoods by the American Planning Association, a nonprofit public-interest and research group focusing on city planning. "The American Planning Association liked "the unique businesses there, the sense of local identity and local commerce," said association spokesman Denny Johnson. "In so much of the country you see more and more franchises. We're not opposed to those, but having a strong local identity is important." Go to Eastern Market, visit the Eastern Market vendors, enjoy the neighborhood businesses and see the Eastern Market Arts Restoration Project Murals. Mircea Cantor presents an additional film and speaks about his work featured in the Black Box space for new media. A selection of Cantor's short films will be screened on Thursday, October 4, at 11 am and 1 pm in Ring Auditorium. All programs are free and take place in Ring Auditorium unless otherwise noted. Seating is limited and available on a first-come basis, so plan to arrive early. Unless otherwise noted, doors open at 6:30 pm; advance ticketing starts at 6:15 pm. One ticket per person. Meet the Artist talks are available for download as free Podcasts. At one time, Afghanistan flourished as a home to artists and intellectuals. As the country reconstructs itself and the arts return, Afghans are regaining their right to “make themselves an image,” a freedom denied under the Taliban regime. In 2004, German photographer and filmmaker Wolfgang Bellwinkel, with the support of the Goethe-Institut Kabul, organized workshops to train young, urban Afghans in documenting change in Afghan society and capturing the details of a civil life regained. This exhibition sheds light on the society, culture, and country of Afghanistan while vividly symbolizing the photographers’ state of mind and consciousness. Reception: FRIDAY, October 5, 2007: 6 - 9 p.m. 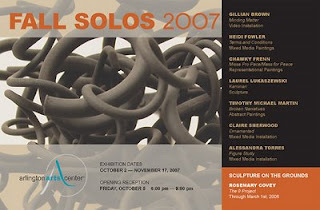 Please join us for a reception on Friday, October 5, 2007, from 6:00 to 9:00 p.m. at the Arlington Arts Center on Wilson Boulevard to celebrate the opening of FALL SOLOS 2007. This collection of seven solo exhibitions-each distinct, and occupying its own gallery at the AAC-encompasses everything from traditional representational painting, to wall mounted sculptural installation, to hybridized projects using video in combination with other media. Gillian Brown projects video onto translucent objects, breaking evocative images apart and refracting or reflecting them onto various surfaces. Heidi Fowler paints images of everyday industrial objects on unconventional substrates-her recent work features networks of phone or power lines painted across collaged beds of junk mail envelopes. Chawky Frenn's representational paintings are dense with art-historical allusions and violence in equal measure. His work has been formed by his experiences growing up in Lebanon, witnessing the atrocities of war firsthand. Laurel Lukaszewski is a sculptor who explores pattern, rhythm, and line using black stoneware and porcelain. The abstract tangles projecting off of the walls in her installation at AAC, Kaminari, playfully represent brush strokes in three-dimensional form. Timothy Michael Martin is an abstract painter who, in his reductive paintings, combines diagrams and schematics with oblique pulp sci-fi references. His work comments on the visual codes of modernism and on utopian and dystopian visions of the future. Claire Sherwood creates mixed media installations with lace, concrete, wax and coal. These materials are combined to form objects that are paradoxically both decorative and crudely industrial--or both stereotypically masculine and feminine. Alessandra Torres is a performance and installation artist. Her AAC project, Figure Study, draws elements from Zen painting and dance; in it, Torres presents flat, jointed, reductively rendered figures mounted on magnets that the viewer is invited to manipulate and reposition at will. FALL SOLOS 2007 will continue through November 17th. Her October arts web site is up. Marilou Donahue speaks with DR. CRISTIÁN SAMPER, Acting Secretary of the Smithsonian and Documentary Filmmaker, KEN BURNS who's 7-part documentary on the Second World War entitled “The War" has been airing this month. Read it here. 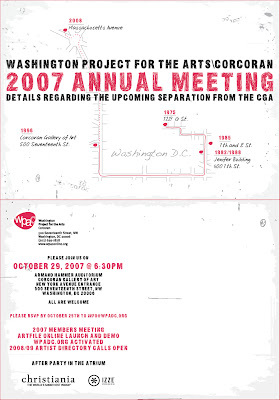 The Board of Trustees of the Corcoran Gallery of Art and the Advisory Board of Directors of the Washington Project for the Arts\Corcoran (WPA\C) announce the formal separation of the two organizations as of December 31, 2007. The WPA\C is a 501(c) 3 artist-based organization that works to promote contemporary art in the greater Washington, D.C. region through a variety of exhibitions, programs and events. The Corcoran’s Board of Trustees and the WPA\C Advisory Board have agreed that their 11-year partnership has been highly beneficial and successful for both, and that the strategic visions of each dictate that independent and non-formal association will yield continued success for each. Over the past 18 months, both organizations have been engaged in extensive strategic planning, with the Corcoran focusing its attention on uniting its gallery and College, while the WPA\C has been planning a return to its “grass roots” foundation and a focus on programming and outreach from within the community that started the WPA in 1975. The WPA\C has been functioning and growing under the umbrella of the Corcoran Gallery of Art since 1996, when the Corcoran generously opened its doors to the struggling organization, and was officially named WPA\Corcoran. This partnership united the independent spirit and regional focus of the former WPA with the institutional strength, profile and historical perspective of the Corcoran. Assuming approval from the Corcoran’s Board of Trustees at a meeting in late September, the final steps in the transition of the WPA\C to the WPA will be confirmed and, by the end of the year, the WPA will relocate to new offices in the Dupont Circle area. WPA\C Executive Director Kim Ward described the separation as an opportunity to continue to grow and build on the group’s reputation and recognition as an alternative destination for fine and contemporary art to the larger, more recognizable art institutions found in the region. “We are excited at the prospect of being back in the community of artists and audiences that we’ve worked so hard to develop, where we’ll be more visible, more accessible and more available to serve our members and the public,” she said. With an administrative office but no dedicated exhibition space inside the Corcoran, the WPA\C made the most of its mission through programs, exhibitions and events in borrowed spaces from storefronts to other gallery partnerships and, occasionally, at the Corcoran. Over the past 11 years, the membership base has grown from approximately 300 to a mix of more than 1,000 artists. The organization’s general audience exposure via exhibitions, performances, gatherings and virtual exhibitions extended to more than 50,000 in the past year. artist members’ portfolios in a variety of media developed by the organization and available on the world wide web. The ArtFile Online is a resource for curators, collectors, consultants, writers, critics and students.enabling all to see the works of regional artists and contact them directly to learn more, purchase, or select works for future exhibitions. The partnership between the WPA\C and the Corcoran Gallery of Art yielded many unique and distinctive events and programs over the last 11 years. These projects include the Annual WPA\C Art Auction, the exchange of faculty, curators and artists from within the institution, and the ongoing WPA internship program that has included students from the College. 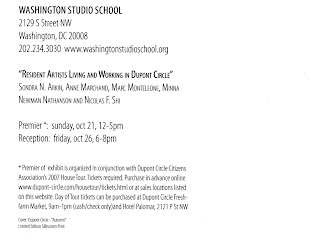 Upcoming events and programs for WPA\C include OPTIONS 2007, a biennial exhibition showcasing the best of new and unrecognized artists in the greater Washington, D.C. region, opening on Thursday, September 13 at Pepco’s Edison Place Gallery in downtown D.C. This year’s OPTIONS exhibition is curated by Paul Brewer, Director of the Hudson Valley Center for Contemporary Art in New York, and will include works by 10 area artists. 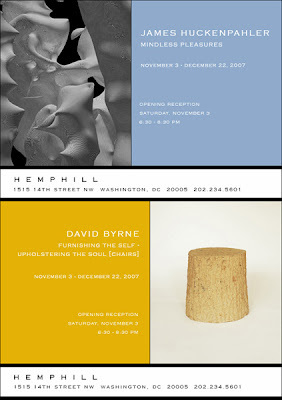 The season continues with monthly ongoing 9x10 WPA\C member exhibitions at the William W. Parker Gallery located at 629 New York Ave. NW, which continues through January 2008, and in March 2008, the WPA will host the 27th art auction fundraiser, a very “non-Washington” gala event and silent auction that helps to support operational and programming efforts. Further details regarding the WPA\C’s separation from the Corcoran Gallery of Art will be discussed at the WPA\C Annual Meeting, October 29th, 6:30 pm at the Corcoran Gallery of Art. This event is free and open to the public. WPA\Corcoran is an independent, non-profit 501c(3) organization whose mission is to promote excellence in contemporary art in the region by presenting experimental exhibitions and performances, stimulating dialogue between emerging and established artists, and involving artists in educational programs that benefit local residents. For more information, visit www.wpaconline.org. The Corcoran Gallery of Art, a privately funded institution, was founded in 1869 as Washington’s first and largest non-federal museum of art. It is known internationally for its distinguished collection of historical and modern American art as well as contemporary art, photography, European painting, sculpture and the decorative arts. Founded in 1890, the Corcoran College of Art + Design is Washington’s only four-year college of art and design offering BFA degrees in Photojournalism, Digital Media Design, Fine Art, Graphic Design and Photography; AFA degrees in Digital Media Design, Fine Art, Graphic Design and Photography; a five-year Bachelor of Fine Arts/Master of Arts in Teaching (BFA/MAT); and a two-year Master of Arts (MA) in Interior Design or History of Decorative Arts. The College’s Continuing Education program offers part-time credit and non-credit classes for children and adults and draws more than 2,500 participants each year.